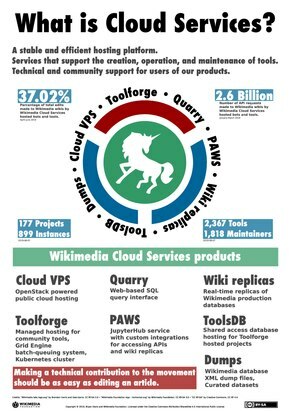 1.1 What is Wikimedia Cloud Services (WMCS)? What is Wikimedia Cloud Services (WMCS)? Wikimedia Cloud Services (WMCS) provides tools, services, and support for technical collaborators who want to contribute to Wikimedia software projects. WMCS is a computing ecosystem built on OpenStack, GridEngine, and Kubernetes. WMCS products and services are available for use by anyone connected with the Wikimedia movement. Support and administration of the WMCS resources is provided by a Wikimedia Foundation Cloud Services team and Wikimedia movement volunteers. We maintain a Glossary of related terminology. From 2011 until early 2017, WMCS was known as "Wikimedia Labs." The term 'Labs' was used to refer to a number of different components, and clarification was required. In 2017, the project was reorganized. The former Wikimedia Foundation Labs team and the Tool Labs Support team joined together to create the Wikimedia Cloud Services team. VPS Cloud VPS Provides collaboratively owned collections of virtual private servers where users develop and maintain software projects that help the Wikimedia movement. Use this to run full virtual instances. You are willing to administer instances on your own. We can provide quota to do so. PaaS Toolforge Provides a shared hosting/platform as a service environment for running bots, webservices, scheduled jobs, and data analysis. Run a specific webservice, scheduled job, or perform analysis. You do not want to or are not able to manage a full virtual environment. DaaS Data Services A collection of products including private-information-redacted copies of Wikimedia's production wiki databases and access to Wikimedia Dumps. Create replicas of the production databases and other data for analysis and experimentation. The Quarry service provides database access via a web interface. Some DaaS resources may need to be requested for specific VPS projects. We are in the process of changing the language and branding of the products and services we offer. You may find some outdated titles and names in WMCS documentation. Edits are welcome! First, read the WMCS Quick start guide for information about how to create a Wikimedia developer account and to learn how to become active in Wikimedia software projects. Agreement to disclosure of personally identifiable information (covers End-Users). Toolforge tools must be open source software licensed under an OSI approved license. Cloud VPS and Toolforge At-A-Glance: This page provides a basic introduction to Cloud VPS and Toolforge. WMCS technical documentation: an in-depth index of technical information.